It is estimated that 120,000 people from far and near visit Chanonry Point on the Black Isle. This spit of land jutting into the Moray Firth just east of the Capital of the Highlands, Inverness, lies between Rosemarkie and Fortrose and points towards Fort George. But why does it get so many visitors? Chanonry Point is one of the best places in the UK to watch certain marine mammals. Bottlenose dolphins, as well as other species such as harbour porpoises, can be seen swimming and feeding by simply standing on the beach. an extreme tidal current brings salmon into the Firth and, close behind, the dolphins. 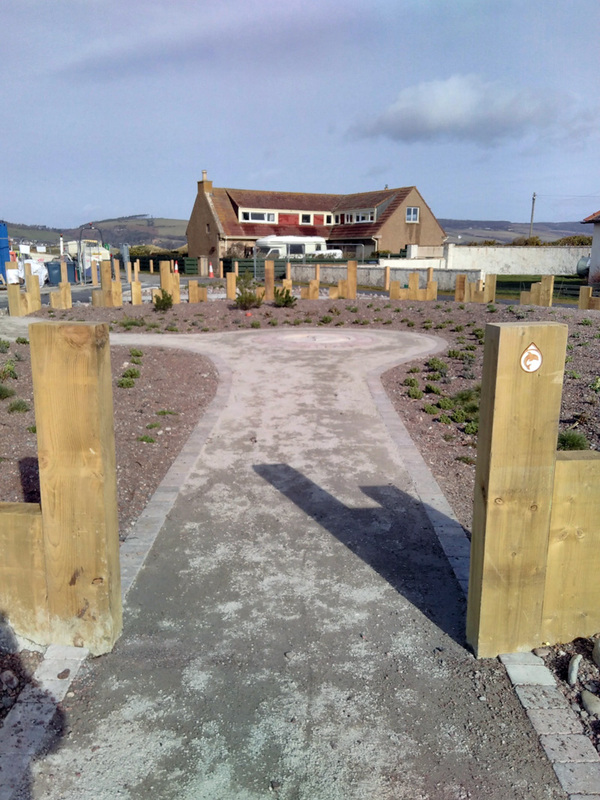 Due to the sheer numbers of visitors it became necessary to landscape the area around the point. 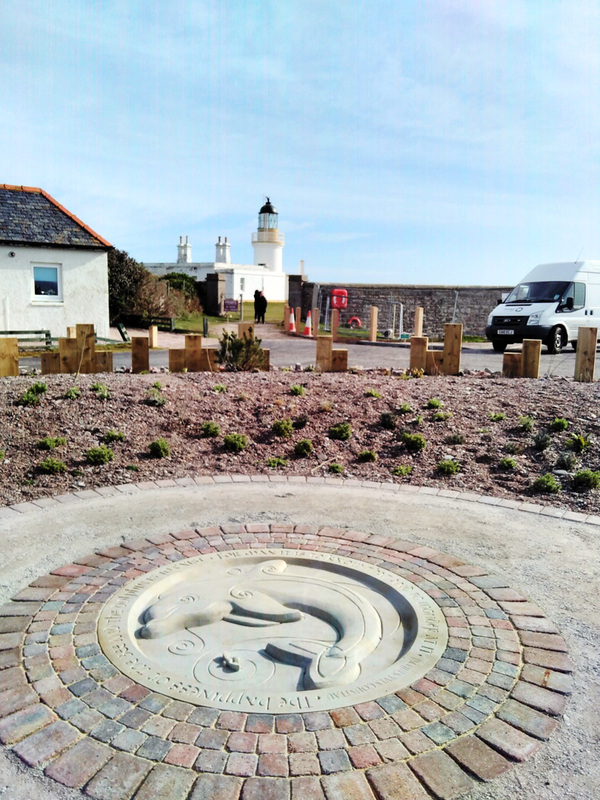 I was commissioned to produce a deep relief carving as a central focal point within a planted ’roundabout’ garden. 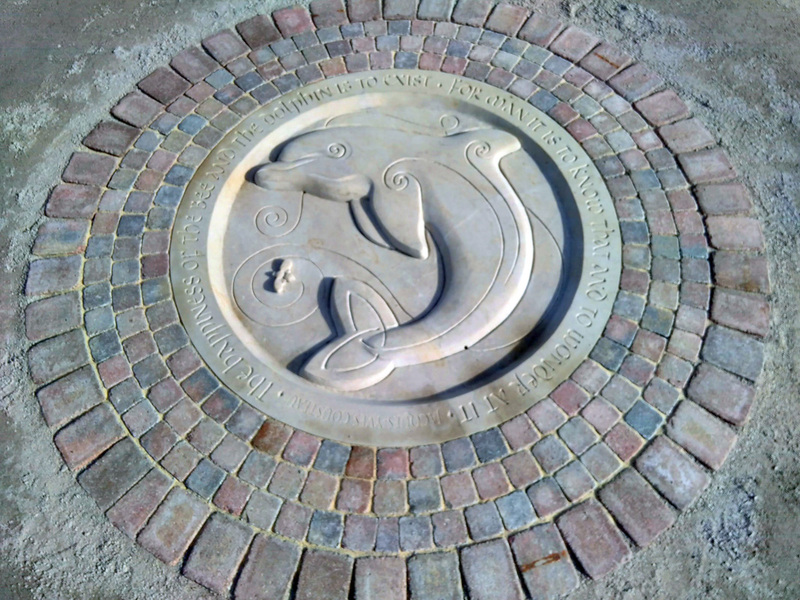 The dolphin sculpture for Chanonry Point is made from Spynie sandstone and measures 1.3m (4’3″) in diameter. 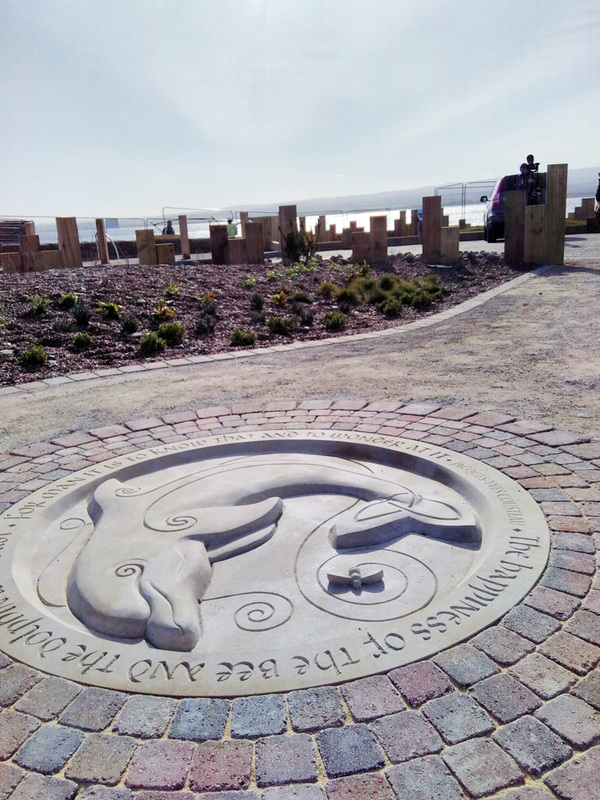 The sculpture contains a bottlenose dolphin at its centre with a bee and its flight trail shown around the dolphin. Around the circumference of the circle is a hand-cut quotation from Jacques-Yves Cousteau – “The happiness of the bee and the dolphin is to exist. For man, it is to know that and to wonder at it”. The quote was chosen by the client and was the reason for the subject matter. 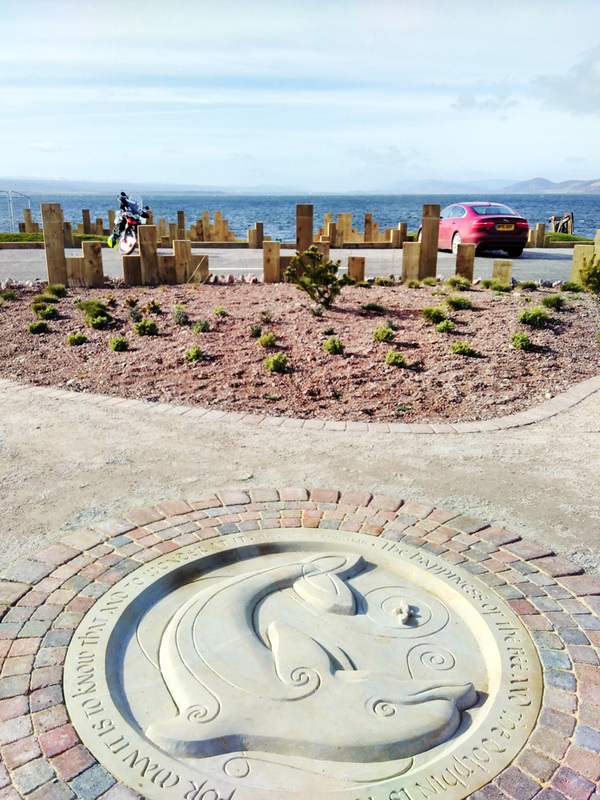 As often appears in my work, I have included Celtic and Pictish motifs and designs to highlight the history of the area, notably the proximity of the Pictish Trail. A notable element is the “Pictish Beast”. 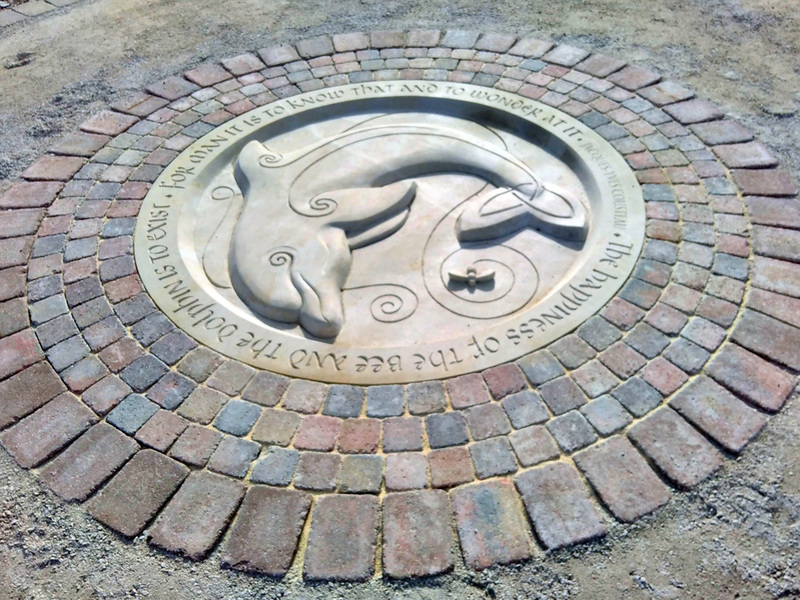 My sculpture of The Loch Ness Monster for The Commonwealth Games in Glasgow in 2014 was based around the ancient design and stone carvings showing this Pictish Beast. 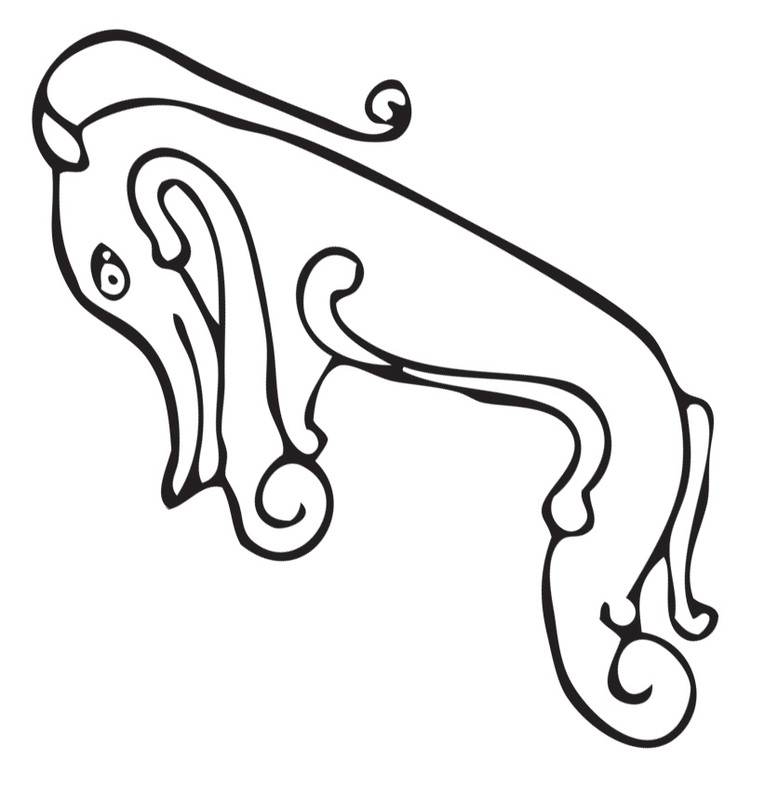 Although it is not known to this day exactly what the design signifies, one thought is that it represents the dolphin. The more astute viewer may notice that the bee’s flight path above the dolphin’s head curls as a nod to the Pictish Beast’s ‘horns’.